The other day I got an email from Frieda’s Specialty Produce Company asking if I would like to try some of their new little fancy purple Fiesole artichokes grown by Baroda Farms in Lompoc, California. Well, that was a no-brainer. Of course!! They were part of a promotion with Ralphs supermarkets and Maria’s Kitchen April 25 – May 6th. But because of an email snafu, the Fedex truck with my little artichokes arrived Friday morning, May 4th, just as I was walking out the door to drive to CampBlogaway for three days in the local Los Angeles mountains. The directions on the package said the Fiesoles would last in the fridge for 4-5 days, and they did, beautifully. 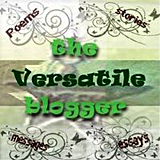 And that is why I am posting about them after the promotion, which, if you really want to, you can read about here. 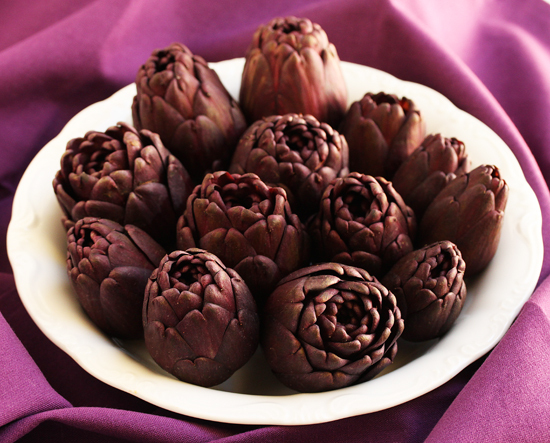 Fiesole (fee-ay-so-lay) are a special baby artichoke variety with a rich purple color. They are about the size of a large egg and are rich, nutty and highly flavored. The beauty of baby artichokes is that they are almost entirely edible because they have no choke inside (the fuzzy, inedible part found in large artichokes). They are a great source of fiber and we all know how important that is. I first made this recipe way back around 1985 with large globe artichokes. 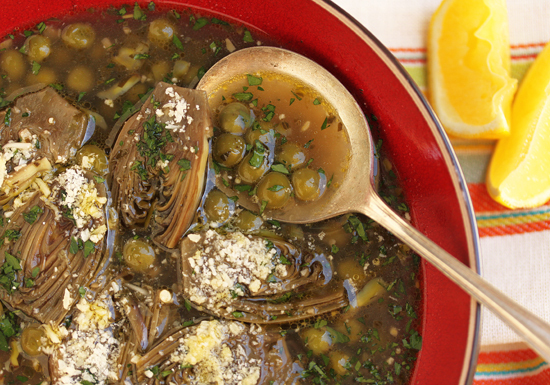 The broth is garlicky and rich with the flavor of the artichokes. The parmesan and Italian parsley sprinkled over before serving, along with a squeeze of lemon, puts the flavor level over the top. This has been such a tasty recipe in my collection that I decided to try the Fiesole artichokes in it. OMG they were so intensely artichoke-y and delicious. And so cute and photogenic. They just have that Oooh factor. All together now…. Ooooh! I received the Fiesole Artichokes for free from Frieda’s Produce Company, but was not required to write about them. All opinions expressed are my own. 1. Snap off the tough outer leaves of the Fiesole artichokes, and trim stems and about ½ inch off the crowns with a stainless steel knife. Rub cut sections with the lemon half as you trim. 2. 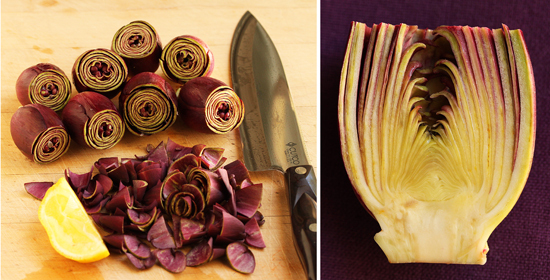 Slice each Fiesole artichoke in half length-wise starting through the stem end, and slice each half into two more slices. 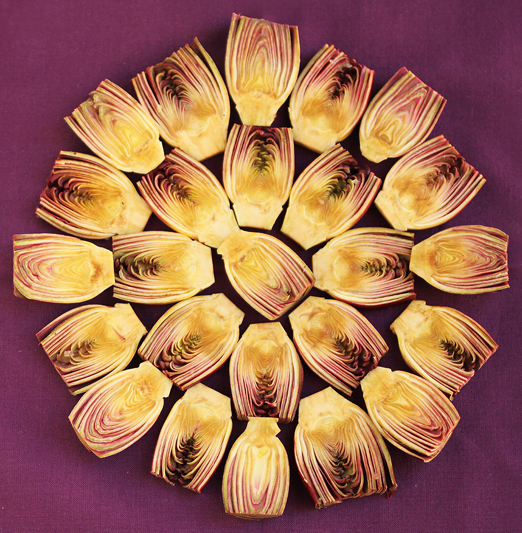 A total of four slices per artichoke. Rub with lemon. 3. In a large saucepan or Dutch oven over moderately low heat, cook the garlic in the olive oil until golden, about 3 minutes. 4. Add artichoke slices, parsley and salt and cook until the artichokes are slightly softened, about 5 minutes more. 5. Add the chicken broth, increase the heat to moderately high and bring broth to a boil. Reduce heat to moderately low and simmer until artichokes are tender, about 20 minutes. 6. Add peas and cook until just tender, about 15 minutes for fresh peas and 10 minutes for frozen. Add up to 1 ½ cups water to broth in pan to replace liquid that has evaporated. 7. Ladle soup into serving bowls and sprinkle with Parmesan cheese and flat-leaf parsley. Serve with lemon wedges. Simply stunning! You have outdone yourself again. I hope the season’s not over for these. 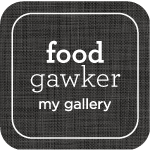 I had a caprese sandwich chock-full of baby chokes at Curious Palate and was smitten. Now, doubly smitten! I am also not that great with artichokes, it seems everytime I cook them I don’t do it right. This however looks amazing and just right.